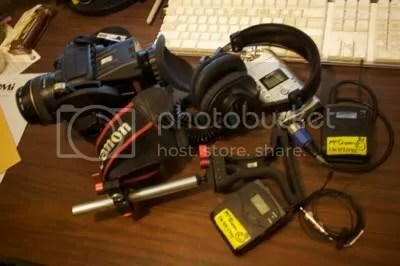 Here is my workflow for HD-DSLR shooting, ENG style. I was quick to jump on the HD-DSLR band wagon. I loved the depth of field look that I was able to achieve. Previously I had been shooting HMC-150 with a Redrcock Micro setup. Although it was very nice, it was also very large, of course heavy and needed about 3k worth of lights to get a good image. When the DSLR’s came out I jumped on them real quick like. Quickly learning their advantages and major disadvantages. I first had the Nikon D90. Its 5 minute record time and lack of manual control sucked majorly. However, it was possible to get some good video out of, Karl Bike check. Canon quickly stepped up with the 5d mkii and added manual control, and then followed suit with the 7D. So I ditched the D90 and went with the 7D. Best decision ever. Since having the camera I’ve shot multiple videos with it. Some being more simple and others being a bit more complex. I’ve shot a few weddings, a bunch of web videos and even a broadcast spot. One thing about shooting with these cameras is the workflow is completely different than with a real video camera. These DSLR’s aren’t very well designed for video, they just happened to be able to shoot very amazing video so we deal with it. 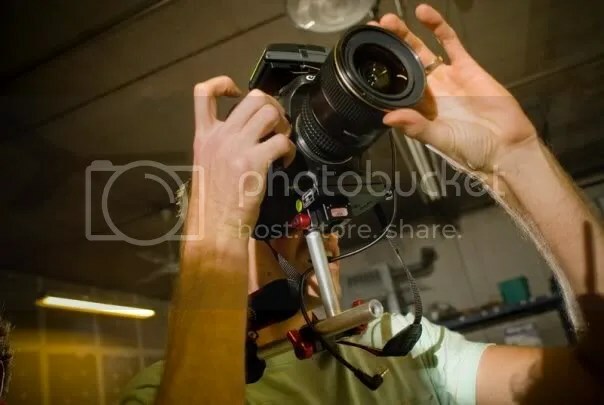 So when I’m called upon to shoot a video, the first thing I think about is, “hmm… which camera am I going to shoot with…” I always think 7D first, cause it looks amazing. But then I have to think about its limitations. Will this be a long record time shoot? Will there be a lot of movement requiring me to manually focus a lot? Will there be a lot of run’n and gun’n? Will I have to do walking shots and lots of hand held? If the answer to all of those questions is yes, then I go for the HMC-150. But if some are no then I think about the other possibilities of using the 7D. Can I just record audio separately, trim out some bad parts and cover with b-roll? If thats the case, then 7D. So here’s a scenario that played out this week. A local artist, Erik Beerbower, takes scrap bikes and turns them into tables. 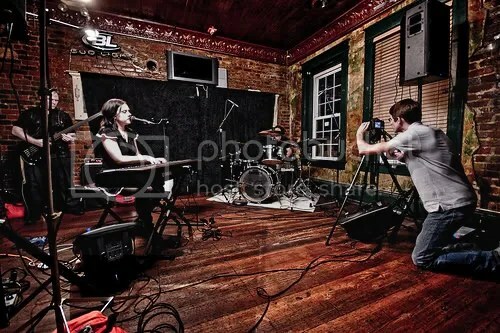 A fairly chill shoot. But I know Erik and he’s got a lot of energy, so he’s probably gonna be running around crazy at some parts of it. That could be some focus issues. But what other shots will I be getting? When he’s building this table he’s going to be within a confined area somewhat, which is majority of the story driving element. Boom! 7D it is. A quick phone call to Erik and we meet up at Re-Cycles, a local DIY style bike shop. The owner, Merritt gives Erik old bikes from his bike pile in the basement. Grab some shots of Erik and Merritt digging through bikes, Erik gets 2 he likes and we hit the road. Upon getting to the studio I mic up Erik. Countryman B6 taped under his shirt with transmitter in his back pocket, well concealed. I stick the receiver attached to a Zoom H4 in my pocket, toss on my Sony 7506 headphones and hit record (wearing headphones the whole time of course, because you always must monitor your audio!). I set up a Canon 50D on a tripod for a time lapse shot and we get started. Erik is doing a little bit of “in the moment” type of dialogue about what he’s doing and why. I love to get that type of stuff to mix in with interview segments. keeps the story interesting to mix in with the sit down boring talking head style stuff. So he’s cutting, grinding, banging, welding and all kinds of interesting stuff. I’m shooting short shots here and there, a bunch of different angles, wide, tight, some pans(being very smooth of course). I’m using my 7D with Zacuto rapid-fire and Z-finder for my handheld with a 50mm 1.4 lens. I had my wide lens on the 50D for the time lapse. So Erik finishes his bike up, “ta-daaa”. And yes, my Zoom H4 is still rolling, capturing every bit of sound via his wireless lav. We go inside and grab a quick sit down interview. I bounced back and forth between a 50mm and a 20mm lens during the interview. Erik is real active with his hands so while he’s describing building his first bike I get some really cool shots of him, with a nice soft background. I finish up by grabbing some cool shots of previous bikes he’s made and I hit the road. Back at my office the 2nd part of the fun comes. Post. What I do first is offload all of my clips. I put the raw video into a raw video folder, the 1 long audio clip into and audio folder, time lapse images, all 226, into its own folder and then I start the converting. 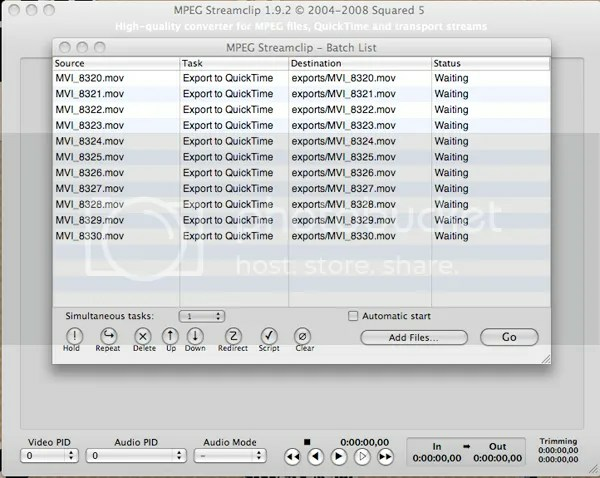 Using Mpeg Streamclip I batch convert all of my video clips to 1280×720 using the Apple Intermediate Codec. I’m not doing a lot of color correcting, if any, so no real need for ProRes and plus it saves space. I save those to another folder titled, “7d-video-aic” and let that run while I go grab some food. When I get back all the converting is complete. 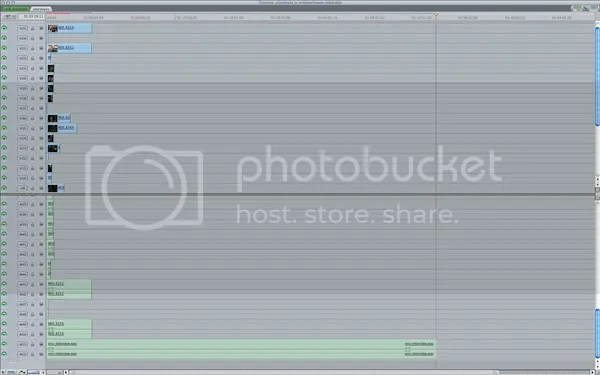 I create a sequence titled, “pluraleyes” and place all the clips and the one long sound file on that sequence timeline. I open up plural eyes and hit sync. While thats doing its thing I’ll take all the timelapse images, and using quicktime create an image sequence at 29.97 frames per second, as thats what I shot the video at, progressive of course, and save it as a self contained quicktime file. 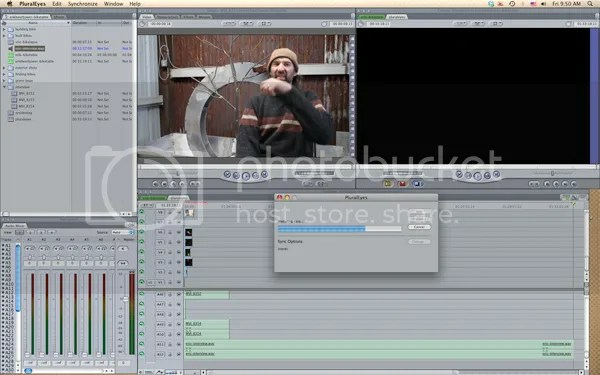 Once thats done I go back to Final Cut and plural eyes is done with its syncing, aka voodoo magic. I’ve got one long timeline, 33 minutes, as thats how long the audio clip was, and all the video clips are lined up on it. 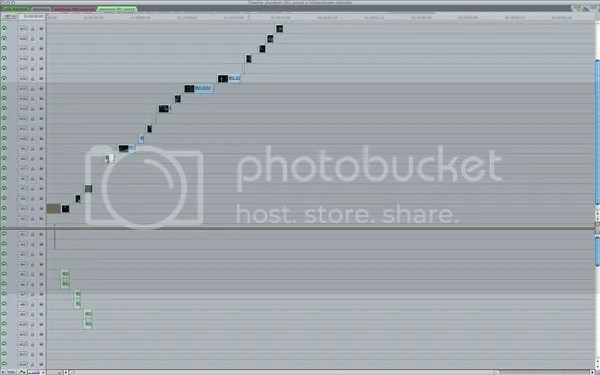 all the clips from shooting while audio was recording are dumped into a timeline named “pluraleyes”, each clip on its own track. then its as simple as opening up the plural eyes app and hitting the sync button. after plural eyes has did its thing, you’re left with all the clips lined up with their matching audio. I then bring all of the clips down on to tracks 1, 2 and 3 for easier editing. Then I edit. As I was shooting I made sure to listen to what Erik was talking about so that I could start piecing together the edit in my head as I was shooting. But if you’re reading this, I assume you are an editor so I’m not going to go into how to edit. Here is my final timeline after editing. Nothing fancy, just cutting and some audio fades. After I’m done editing I’ll burn all the content to DVD’s for back up. I’ve exported a raw final cut quicktime, a compressed h264 HD version for youtube/vimeo and a flv version for News & Record’s video player. I’ll also export a still for use in promoting the video in print and as a thumbnail for the video. Click here to view the video on youtube in HD. So thats my workflow for an ENG/DOC piece using the 7D. Obviously this workflow could change depending on the type of shoot you were doing. This is my way of doing things and its seemed to work very well so far. If you have any questions, hit me up on facebook, twitter or email. Thanks! Great post man. I’d love to talk shop sometime. I got into the dslr thing about a year and a half ago. Found you through JW sound. thanks man, i’ll drop you an email!